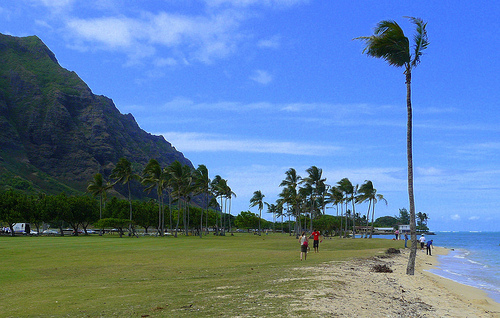 Kualoa Beach Park has come into its own within the past several years having been totally refurbished. Located in a stunningly beautiful area of Oahu’s Windward coast in the Ko`olaupoko ahupua`a, Kualoa in Hawaiian means long ancestral background as this area has a rich ancient and sacred history. Mokoli`i, is said to be a fluke of the cut off tail of a dragon-like creature. Hi`iaka (or Hi`iaka i ka pali o Pele), goddess of lightning and Pele’s younger sister, was traveling along the Windward coast when she came upon great Mokoli`i, the Mo`o dragon. Hi`iaka mightily fought with the giant lizard and slayed it with spears of lightning. She then dismembered and used the body to form part of the base of Hakipu`u road. And when she threw the tail away, it landed in the ocean by Kualoa. The islet, today popularly referred to today as Chinaman’s Hat &, because it looks like a coolie’s hat to some, is – obviously – the tip of one of Mokoli`i’s tail flukes. 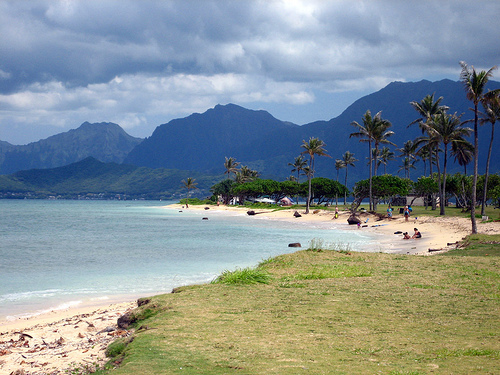 This area is considered sacred to the ancient Hawaiians because whale bones used to wash up on the beach. The bones were then made into valuable tools and jewelry. Erosion has nearly wiped out the beaches sand. Swimming and snorkeling is just great but watch out for the currents as they are occasionally strong. Please pay special attention to your keiki (children) in these currents. 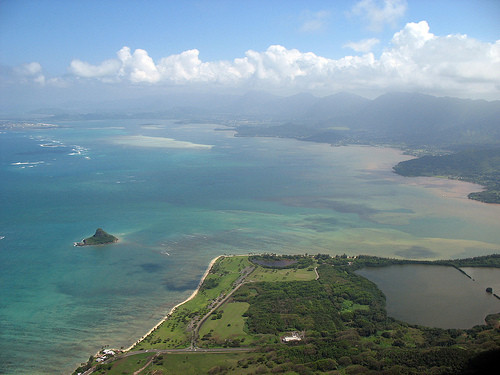 Kualoa Beach Park OCEAN INFORMATION — For a detailed description of the Pacific Ocean’s marine climate, water properties, currents, tides, waves, etc., please visit The Ocean Atlas of Hawaii online. You’ll learn many interesting facts, like our average surface water temperature in Winter is 75 F (24 C) and 81 F (27 C)in the Summer.Call 596-SURF (that’s 596-7873) to hear a recorded message on conditions at various O`ahu beaches. The recording is a free service of the Surf News Network (SNN) and is updated four times a day, 365 days a year, at 7 a.m., noon, 3 p.m. and 7 p.m. In addition to wave heights, SNN provides information on winds, tides, and buoy readings.